For those screaming "Walk-Out or Strike"....that's EXACTLY what the Evil Side (GOP) wants ! All part of the diabolical plot to DESTROY Middle America...forcing them to work at Chinese wages...and be glad about it. (Mother Jones) On Wednesday night, Republicans in Wisconsin's state senate rammed through a retooled version of Governor Scott Walker's controversial "budget repair bill" with the 14 senate Democrats still in hiding in Illinois. The senate bill eliminates collective bargaining rights for most public-sector unions, a provision that has labor leaders and protesters up in arms. But there's another explosive provision in the bill that's received little attention: The bill authorizes state officials to fire any state employee who joins a strike, walk-out, sit-in, or coordinated effort to call in sick. According to an analysis (PDF) of the Senate bill by Wisconsin's Legislative Fiscal Bureau (LFB), the legislation gives state officials the power to fire workers during a "state of emergency" declared by the governor under several conditions. If a state employee misses three working days without an approved leave of absence, that's grounds for being fired. State workers can also be dumped if, according to the LFB's analysis, they participate in a "strike, work stoppage, sit-down, stay-in, slowdown, or other concerted activities to interrupt the operations or services of state government, including mass resignations or sick calls." The implications of this under-the-radar provision are significant. After the state senate passed its bill, talks swirled of organizing a coordinated strike or walk-out to protest the bill's attack on collective bargaining. In the state Capitol, chants of "general strike!" broke out among protesters stuck outside the building. On Wednesday night, Madison Firefighters union president Joe Conway said he's "in total agreement" with the idea of a general strike. "We should start walking out tomorrow and the next day, and see how long they can last," Conway said. 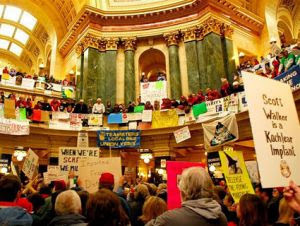 Under this measure, if such protests occur, Walker could declare a state of emergency, and protesting workers could be canned. One labor umbrella group, the South Central Federation of Labor, which includes 97 member unions and more than 45,000 employees, endorsed the idea of a general strike as early as February 21. The SCFL's affiliates include the American Federation of State, County, and Municipal Employees, the American Federation of Teachers, Service Employees International Union, UNITE HERE, and many more. Other union groups have organized "solidarity" events throughout the state for Thursday morning—from Green Bay to Fond du Lac to Platteville—to peacefully protest the Senate's blitz vote on the bill.